There was a time when DV Expo was a big deal—a convention that was well attended by the public, where vendors were plentiful, and where important product announcements were made. In 2001, Apple picked DV Expo to launch Final Cut Pro 3, and, in those days, you could spend the better part of a day wandering the show floors. This year, DV Expo felt small—so small that Apple and Adobe didn’t even have booths in the exhibit hall. I think it’s following a trend with these types of trade shows—the National Association of Broadcasters (NAB) convention in Las Vegas has also shrunk in recent years, but it remains gargantuan compared to what I found in the South Hall of the Los Angeles Convention Center this year. But, despite the show’s size, there were still things to see. While some exhibition presenters lamented the decline of the convention, other vendors like Wes Plate, the head of Automatic Duck, found this year’s DV Expo to be better than in years past, based on the quality of inquiries he was getting. Wes Plate from Automatic Duck (left) going over Pro Import FCP software with a DV Expo attendee. Automatic Duck, which specializes in software that helps migrate projects between Apple’s Final Cut Pro, Avid systems, Discreet’s Combustion, Adobe After Effects and Digidesign’s ProTools, announced the release of Universal binary versions of its two most popular products, Pro Import FCP 2, which lets users load Avid projects into their Final Cut Pro systems, and Pro Export FCP 3, which effectively does the reverse (we reviewed the first version of Pro Export [ ] in 2003). Pro Import FCP and Pro Export FCP are each priced at $495; upgrades are $195. Automatic Duck wasn’t the only company showing off Universal versions of their software. Sorenson Media announced Squeeze 4.5, a Universal binary update of their flagship product, which the company boasted has about a three-fold increase in compression speed. Squeeze 4.5 is available now at the Sorenson website for $499; upgrades from earlier versions of Squeeze 4 are $79, and $299 for those upgrading from Version 3.x. Avid previewed its long-awaited Intel port of Avid Media Composer at the show. The update has been delayed a few months, but is now scheduled for release in early 2007. In addition to Intel support, the new version will feature enhancements to its script-based editing interface and its Interplay asset management and workflow system, as well as Panasonic P2 import support. A Universal version of Avid Xpress Pro is expected in the same time frame. At the Sony booth, High-Definition Video was all the rage and Sony’s 3-chip CMOS 24P HVR-V1U camcorder was the highlight. Similar in size and physical form factor to the HVR-Z1U HDV camcorder before it, the $4,800 V1U offers a true progressive scan capture (as opposed to the Z1U’s not-so-satisfying Cineframe 24 mode) and it lays this film-like, 24-frame progressive video down to 1080i HDV video with a 2:3 pulldown. It also can shoot standard 1080i HDV like its predecessor. Mounted onto the V1U was another product Sony was previewing, the $1,800 HVR-DR60 hard disk recording unit. The DR60 is a 60GB hard drive that sits on top of the camera and records HD video directly from the camera. Then, with a flip of a switch, the DR60 can be converted to a traditional hard drive that can be used by an editing system like Final Cut Pro. It effectively removes the need for capturing video from tape and lets you edit it immediately. (In many ways this product is similar to the Firestore units from Focus Enhancements.) 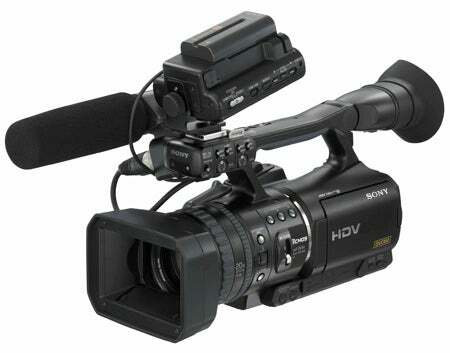 Both the V1U camcorder and the HVR-DR60 hard drive unit are expected to reach the market in the early part of 2007.